Avoid risky sites and prevent dangerous downloads. Keep your inbox free from SPAM. 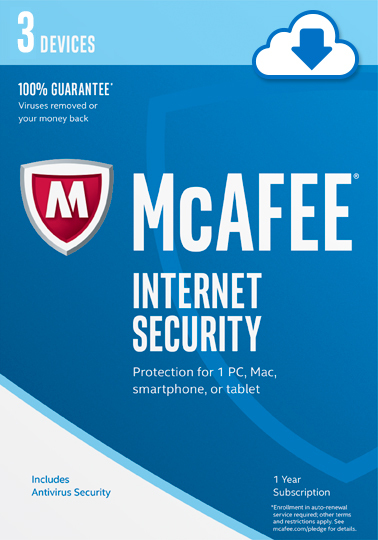 Browse, bank, and shop safely with McAfee Internet Security, which provides trusted antivirus and identity protection for your PCs, Macs, smartphones, and tablets whenever you’re online. With a quick install, it blocks threats using antivirus that’s verified by independent tests-now backed by our 100% Guarantee: a McAfee expert will remove a virus, or your money back! Additional terms apply. Also includes the True Key app, which securely remembers your passwords and instantly logs you into your websites and apps.